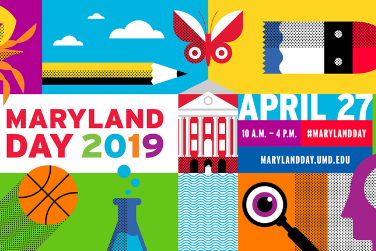 Explore the creativity of Terps and the local community on Maryland Day! This annual campus-wide open house features artistic and creative performances, experiences and activities at The Clarice, across the University of Maryland campus. Bring your family and your friends for a day of fun and frolic! Back for a third year, Bucket Drumming at Maryland Day is a fun, participatory event for the whole family. Come learn the rhythms of Gahu, principles of improvisation and how to create your very own groove: all with a five gallon bucket and drum sticks! No experience or materials required -- just bring your imagination and a smile as we explore the music we can make with our buckets! View displays of Clarice-created costumes from rendering and research to realization, drape your own fashions on half-scale dress forms and color your own historical renderings. Come explore the light lab, where graduate and undergraduate students learn and try out the newest in LED and Moving Light technology in theater. The UMD MFA Lighting graduates will be showing off some of the newest technology in the industry today. Come and sit behind the lighting board and make your own lighting design. It's a different kind of playground! Stack and connect giant foam blocks to construct and create your own world. Join music education students from UMD's collegiate chapter of NAfME to learn some first sounds on a variety of instruments! All ages are welcome! Join the movement and stand up for the arts in Maryland! Learn more about advocacy and express why the arts matter to you. Activities for all ages. Discover an imaginative, mystical playground of thingamajigs and whatchamacallits! Dance, act and sing based on what you find. Visit The Clarice’s Scene Shop to interact with props and immersive set pieces. The Human Library is a “worldwide movement for social change” designed to build a positive framework for conversations that can challenge stereotypes and prejudices through dialogue. The Human Library is a place where real people are on loan to readers. A place where difficult questions are expected, appreciated and answered. Huge painting. Huge history. Huge undertaking by graduate students to recreate certain elements from said painting that helps us understand the stagecraft and theatre history. Come hear the UMD Percussion Ensemble’s drums and percussion up-close and personal in The Clarice’s beautiful Grand Pavilion. Painted during NextNOW Fest 2017, the Unity Mural project brought together students and faculty from Bowie State University and University of Maryland to create a mural that takes a stand against divisiveness. Join OperaTerps, University of Maryland's student-run, undergraduate opera company, for 30 minutes of scenes! Short stories with action words to prompt bursts of movement and physical play. Best for ages 4 - 7. Dance students from the School of Theatre, Dance, and Performance Studies will demonstrate how a dance is created by presenting their own work, fielding questions from the audience and engaging the audience in the craft of choreography. The University Band is a musical outlet primarily for non-music majors interested in performing in a wind band. The University Band performs traditional and contemporary works from the band repertoire, as well as transcriptions from other media. When it opened in 2001, The Clarice Smith Performing Arts Center was the largest single building constructed by the State of Maryland. Explore this unique building in a special hour-long backstage tour! Get your robot groove on! Create and decorate your very own cardboard robot costume, then step onto the dance floor, break loose and show off your coolest robot dance moves to DJ Kid Koala's kid-friendly tracks. Robot costume supplies are available starting at 10:30AM and are available while supplies last. Learn about the opportunities at the UMD School of Music for students who are interested in majoring or minoring in music, or those who would like to participate in music while in college without being a music major. Shake Your Terp Tail Feather Dance Class! Get moving with Delta Chi Xi Honorary Dance Fraternity for an upbeat warm-up and fun new choreography! Open to all experience levels. The brothers of Phi Mu Alpha Sinfonia present a collection of songs written, composed and/or arranged by all American musicians! The American Music Recital is a favorite tradition of Phi Mu Alpha! Hear great performances by great pianists of the past and present on the Boesendorfer 290SE digital reproducing piano. Through voice and movement, we will enliven our minds and bodies before exploring personal identities in choreography. No prior dance/theatre experience necessary! Interested in studying dance at the University of Maryland? Learn more about the dance major in the School of Theatre, Dance, and Performance Studies. Show your Maryland pride by singing along with the Maryland Victory Song and other Big 10 Fight Songs! Presentation of classic jazz tunes by the greats of jazz along with original numbers by students, representing the present day and the future of jazz. Experience the splendor of classical Chinese dance and learn to move in this ancient and beautiful movement tradition. An interactive demonstration of music notation and digital audio software: write a song and hear it played back to you! Vincent Novara, Curator for Special Collections in Performing Arts, will perform selections for solo snare drum. The program includes experimental works that highlight uncommon techniques and compositional approaches. The Original Works Project consists of student productions written and directed by talented female students from across the University of Maryland. These productions are also performed by students. Experience a mini-concert of inspired dances by undergraduate choreographers that are in development for the upcoming UMoves: Undergraduate Dance Concert in May. Get a behind-the-scenes look at the arts advocacy process in Maryland. Learn how public funding for the arts works in our state and what you can do to be an active participant. Interested in studying theatre at the University of Maryland? Learn more about the theatre major in the School of Theatre, Dance, and Performance Studies. The horn studios of School of Music faculty members Gregory Miller and Phillip Munds present music for horn choir. Join the Maryland Community Band for a variety of musical selections from pop, classical, big band, Broadway and film. Join the students of the Maryland Opera Studio as they take you on a musical journey through operatic selections. Come experience beautiful restoration and rejuvenation through pilates-based movement. Dancing might happen too. No experience necessary! Do you think you're Kreative™? Take a look at the art this student group can create in just 10 minutes or less! Members of UMD's student-run new music ensemble lead a performance of Terry Riley's genre defining piece In C. All are invited to bring an instrument and participate! Join the students in Musical Theatre for an afternoon of songs and scenes from the Golden Age of Musical Theatre - from Ellington and Gershwin to Rodgers and Hammerstein!